I got my first workout in yesterday! Yay! Never did I think I'd appreciate my own online videos as much as I do now. Fitting in my workout while Christian sleeps is harder than I thought but... I did it! I realize that if exercise isn't a priority, it really is so tough to get done with a little one. I started the day with a 2 mile walk with my hubby and pup. Thank God for my Ergo Baby Carrier , I wouldn't get anything done without it. 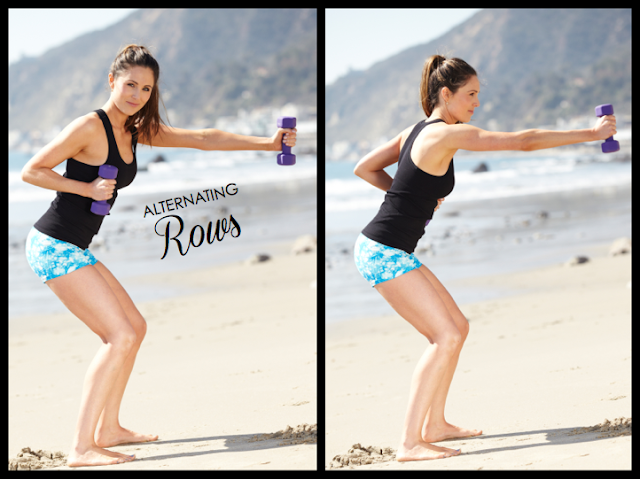 To combat the effects of nursing (boy, oh boy that's a workout in it's own) on my body I continued my workout with a back workout including several variations and sets of rows as described in this post. I finished off my workout with pelvic tucks to re-engage my pelvic floor, my abdominals and even the backs of my legs and a few more yoga stretches to open up the front of my body... I'm planning to post a video next week showing this perfect post-pregnancy exercise. All that nursing, diaper chaining, etc is certainly paying a toll and I'm doing all I can to relieve my body of it's aches and pains! PS. If you're post pregnancy and feeling uncomfortable doing any of the above exercises... don't do them! !